(NX 2090 5335) Broch (NR). Wilson, quoting Gillone's map, calls this 'Crow's Neith', and adds that about a hundred years ago, its stones were much disturbed by a whisky still being placed among them, a supply of water coming from a spring on top of the bank. The ruins of a broch-like structure, called 'Broken Castle' locally; its true character can only be determined by excavation. On the N side, small segments of the outer wall face are exposed, but the inner face is concealed, as is the exterior on the S side. It appears to be nearly circular, 39' x 42'. On the N side, at right angles to one of the exposed segments of wall, facing is exposed for 3' inwards. As neither a continuation nor a return of this wall was to be seen, it is impossible to say if it marks the entrance to a chamber. The exterior debris rises 5' - 8' high. Across the ridge, immediately in front of this structure, there appears to have been a 14' wide ditch. Though this structure, which has strong natural defences has been considered as a broch, there is still an element of doubt about the classification. A recent exposure of the wall faces at the entrance gave a wall thickness of 12' 6", but more than this will be required before a reliable judgment can be reached. A ruined stone structure, identified as a broch by excavation, is situated on a rocky eminence 30.0m above the east shore of Luce Bay. It is bounded and overshadowed on the landward side by a steep coastal slope beneath which is a deep gully with a narrow causeway across it. The continuing excavation by local residents (Mr Lorman, Stairhaven) has so far revealed a well-defined entrance and part of the north wall. The overall diameter of the broch is 14.2m and the width of the exposed, soundly constructed, wall is 3.8m. The entrance is 1.2m wide externally and tapers to 1.0m wide internally; no door checks or bar holes are evident. Just within the entrance, on the north, is an intra-mural passage, and a 1.0m wide staircase with a smaller flight 0.6m wide leading off to a point above the entrance. A small fairly level terrace to the north east of the entrance has traces of walling around its edge and would appear to have been an annexe. The causeway on the east side is 18.0m long by 3.0 to 4.0m wide and is revetted on its north side. The broch apparently has no local name in current use. Visited by OS (BS) 9 May 1977. (?) Broch, Stairhaven (Inventory No. 310). Shortly before the date of visit, Mr de Bear Nichol uncovered the entrance of this structure on the NW (seaward) side, together with the outer face eastwards for a distance of 25 ft from the N side of the entrance. The outer face was found to be standing to a height of 3 ft in seven courses, the stone consisting of a mixture of natural boulders and quarried blocks. The entrance narrows from front to back, and exhibits no sign of door-checks. The width of the wall varies, being only 8 ft 6 inx on one side of the entrance and 12 ft 6 ins on the other, so that, if uniform thickness of the wall is a criterion, the work is not a broch but a dun. At a distance of 4 ft from the inner corner on the N side of the entrance, a wall face has been exposed and returns obliquely from the inner face of the structure for 3 ft 6 ins in to the thickness of the wall. This suggests the possibility of a chamber at this point. A proper survey should be undertaken as soon as Nickol has completed his exploration. Visited by RCAHMS (KAS) 28 September 1953. This probable broch in Old Luce stands on a rocky spur about 9.2m (30 ft) above the sea. Across the ridge, immediately in front of this structure, there appears to have been a ditch 4.3m (14 ft) wide. In 1911 there was little to be seen at the site  but since then “continuing excavation by local residents” [1, reported in 1977] has exposed a number of architectural features. The site is extremely difficult to reach now, particularly along the shore which is crossed by rocky ridges; the approach from above involves a steep climb down. The entrance, facing west-north-west towards the sea, is now exposed and indicates a wall thickness here of 3.81m (12.5 ft). An earlier report said that no door-frame was apparent  but the broken off slab for the right hand check is in position, 1.2 - 1.3m from the exterior; no left check can be seen at present. However this side of the passage has been extended inwards and the primary masonry is doubtless preserved behind this added face. There are clear signs that part of the inner wallface is well preserved and may still stand up to 3m high at about 9 o’clock; thus if the building really is a broch a scarcement may be preserved under rubble here. The top of the inner face at this point appears to be about 3m above the present floor of the entrance (the author did not have his indian clinometer with him) and about level with the top step of the intra-mural stair nearby (eleven steps are now visible). Although the building seems to stand on a rocky surface that slopes downwards towards the sea this still suggests that the inner wall at 9-10 o’clock (on the uphill side) stands at least 2.14 - 3.05m (7 - 10 ft) above the broch floor. How much longer the wall will stand without conservation is unclear. The doorway to the stair is exposed at 7 o’clock and later drystone masonry has been added here also. The extra block against the inner wallface (which extends the passage side inwards) has already been mentioned but there is also a block added against the outer face of the short passage leading to the stair. 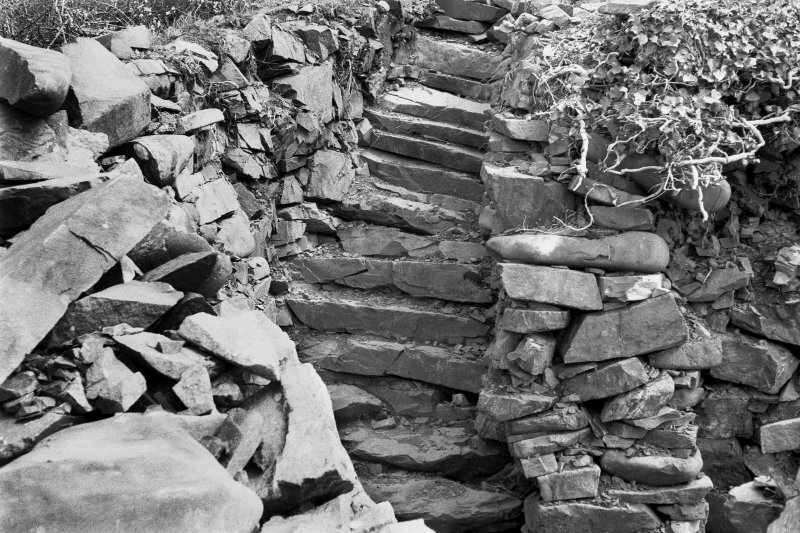 The photograph also shows how three steps of a stair going in the opposite direction – that is, rising up to cross the entrance (presumably at a time when it was still roofed with lintels) – are bonded into this secondary walling. How old these later additions to the structure are is unclear; if ancient they suggest that the broch was partly demolished before they were put in. Sources: 1. NMRS site no. NX 25 SW 9: 2. Wilson 1899, 176: 3. RCAHMS 1912, 114, no. 310: 4. Finlayson and Cressey 2003, 129.